Several years ago I ordered a product online that I would like to share with you. I was looking for a light weight embroidery stabilizer that I could use in the studio for test samples, meaning something that was sold in large quantities at a reasonable price. Somehow I ended up on a web site (Cariff) that sold engineered fabric for landscaping. 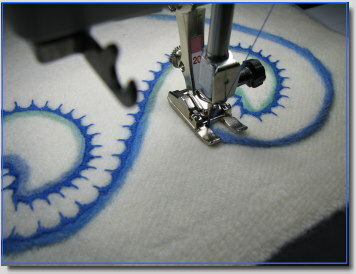 However, they also offered a product for embroidery that peaked my interest. 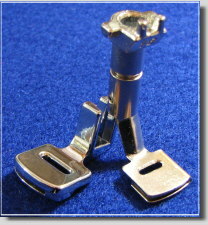 It was available in several weights, the lightest being 0.5. I took a chance and ordered a large roll. Thankfully, it was exactly what I had been looking for. 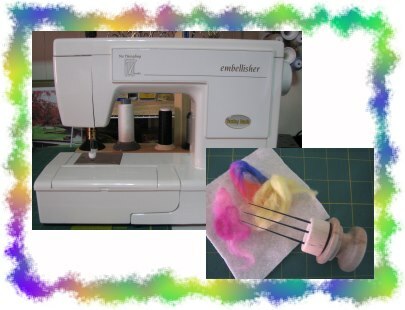 When I first started needle felting with the Babylock Embellisher, wash away stabilizers such as Vilene were the standard. One day the idea came to me to try the light weight stabilizer. I feared it might be too light and tear. To my surprise, it worked extremely well and never seemed to weaken. 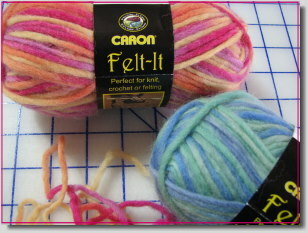 I have used this product in the project below and have posted the company information on the Fiber Art Resources page in the sidebar. There are several advantages in using this product. (1) It’s so light weight that it disappears into the felting, yet it’s strong enough to withstand the countless punches of the barbed needles. 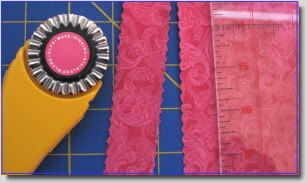 (2) You don’t have to wash your project to remove anything. (3) It’s inexpensive, especially when compared to the price of Vilene. 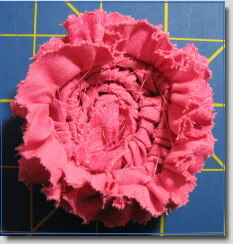 Once the roving is secure, remove the stabilizer from the hoop and turn it over to the back side. Reposition it in your hoop. 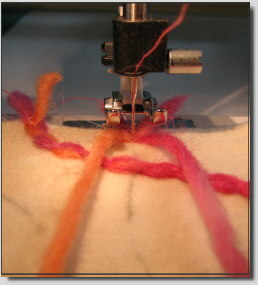 Place another small amount of roving over the area where you previously felted and repeat the process. You may like to change to a lighter color. 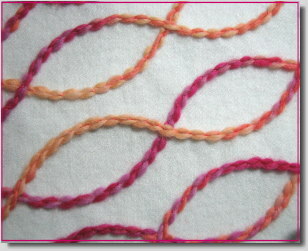 Continue flipping your work back and forth, layering small amounts of roving until you’re happy with the result. Consider using some Angelina or other special fiber. 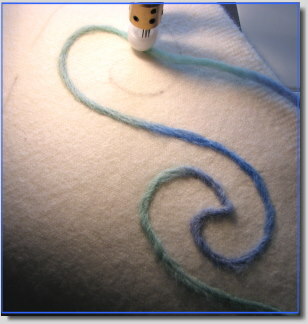 As a final step, needle felt around the edges using a wavy motion just to make sure all fibers are completely felted. Take a look at both sides of the piece and decide which one you like best. At this point you can embellish the leaf with some free motion machine stitching or felt some thin veins with pieces of yarn. You can cut your leaf before or after you embellish it – the choice is up to you. Simply cut away all remains of the surrounding stabilizer. This process can be used for all kinds of shapes, not just leaves. Experiment, experiment, experiment! With the basic structure of this piece complete, I now had to decide whether I liked it just as it was or whether a few additional embellishments were in order. 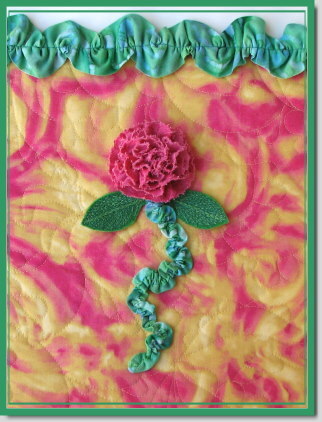 I leaned more towards the latter and thought a few small embroidered flowers might be a nice addition. I chose a freestanding lace flower (purchased from Embroidery Library) and prepared my 100 mm hoop with some heavyweight clear wash away stabilizer. 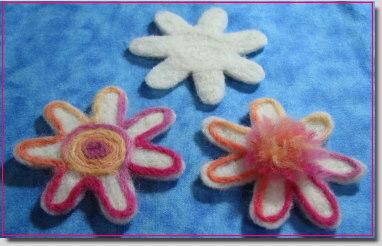 Since the flowers only measured 45 mm each, I was able to embroider all four with one hooping. I removed the flowers from the stabilizer and gave them a quick soak in some warm distilled water. Most American homes deal with some degree of hardness in their water, which can effect the removal of wash away stabilizers. I bypass the whole conversation and just use inexpensive distilled water with perfect results every time. When the embroidered flowers were dry, I began moving them around on the surface until I was happy with their placement. 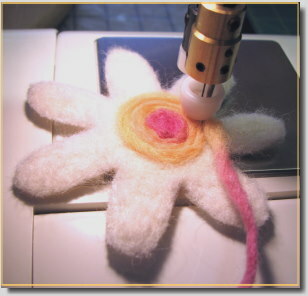 I then threaded a thin sewing needle with regular polyester sewing thread and attached each little flower with a small pearl bead. I wanted to give the felted flowers a little more dimension as well, so I threaded a tapestry needle with 6 strands of silk floss and made six french knots in the center of each one. And with that, Natural Blooms was complete. 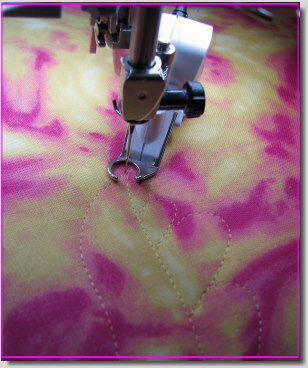 Felting machines and machine attachments provide wonderful opportunities to explore new dimensions in needlework. Some felting projects are freeform, some are planned but still partly intuitive, and some are structured. This project falls more or less into the third category. White on white patterns, whether china or embroidery, hold a certain ineffable grace that continually attracts me to them. I had my “pattern” in mind and proceeded as follows. 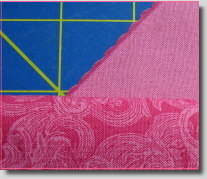 I began by digitizing a fast little flower outline that would serve as my size template as well as my cutout line. 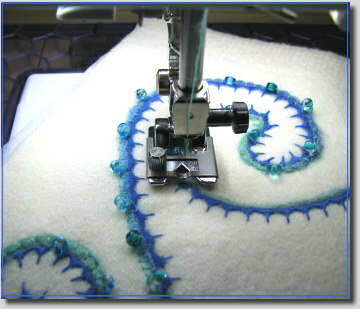 Next, I hooped a light stabilizer, Soft ‘n Sheer Cut-Away by Sulky, into a small embroidery hoop. 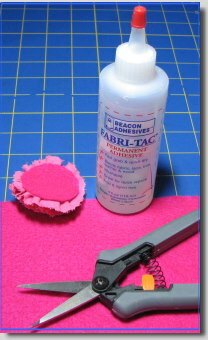 These hoops are great for small projects that require tension on the base fabric. 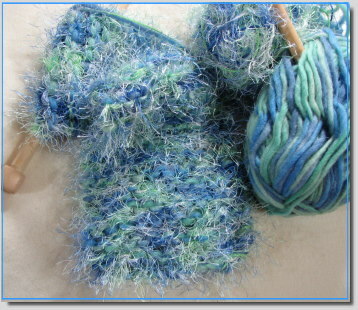 Also, I love the way they enable me to use one hand during the felting process. After hooping the Soft ‘n Sheer, I set the hoop over my flower template to get a basic idea of how much territory needed to be felted. 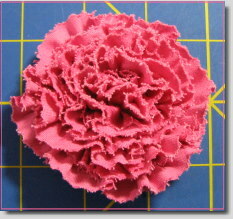 I then gathered a small amout of natural roving and two finger “pulls” of Angelina (Blaze Crystalina). 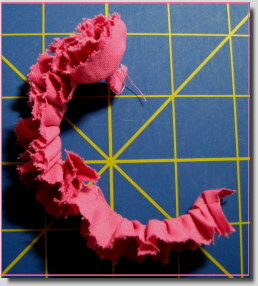 Before I began felting, I flipped my little pile over so that the Angelina would be closest to the stabilizer. For cutout projects such as this one, I work in a circular motion. Starting dead center, I slowly moved my hoop around and around, doing a light tack down rather than any serious felting. 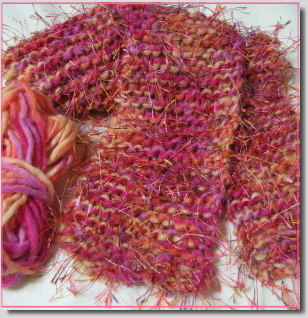 Little by little I added small wisps of roving, layering the wool and filling in bare spots. 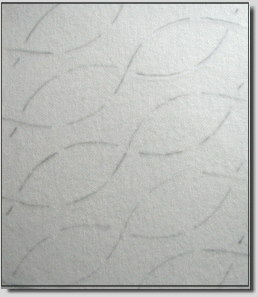 When the circle appeared complete, I did a more thorough felting, continuing in a circular motion. 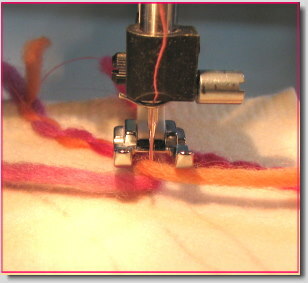 The final felting step was to go over the edges using a wavy motion (think rick rack). To make sure the surface was completely covered, I held the hoop up to a window, allowing light to reveal any areas that needed further work. 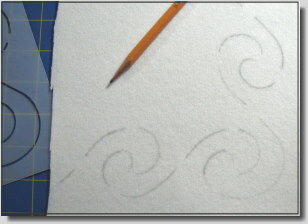 I repeated this process three more times for a total of four felted circles. The final product should make you think of hurricane season because that’s exactly what the pieces look like at the completion of this first stage. 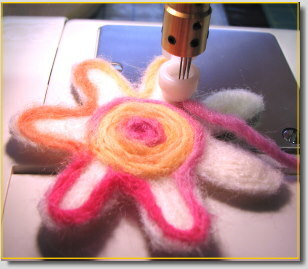 In part two, I’ll share with you how I embroidered the flower outline, precision cut the flowers, and embellished them with a special edge treatment.